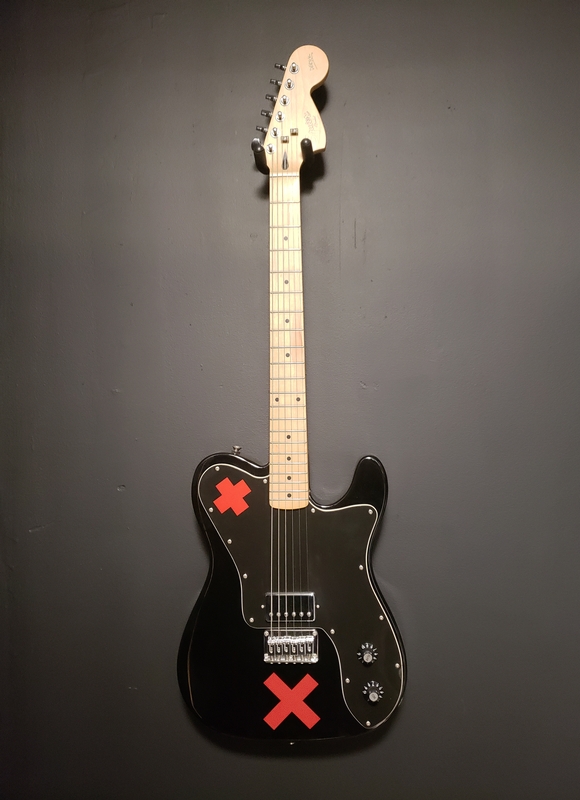 The Squier Deryck Whibley Telecaster guitar's vibe is that of a classic '70s Fender® Telecaster Deluxe model, and features Whibley's signature "red X" graphics and a single Duncan Designed humbucking pickup. Musician and producer Deryck Whibley is best known for his work as lead vocalist and songwriter for Juno Award-winning, million-selling Canadian punk-pop band Sum 41. Built on the Fender Telecaster Deluxe platform (no belly cut) with a maple neck, a chrome-covered Duncan Designed„¢ humbucking pickup, "blackface" amp control knobs, a three-ply black/white/black pickguard and a six-saddle bridge. Artist approved, with distinctive graphics, large headstock design.